The 76th Man & Woman of the Year Awards Luncheon will be on Wednesday, September 4 from 11:30 a.m. to 1:30 p.m. at the Coral Casino. Tickets go on sale July 29. We encourage all community members to submit nominations for the 76th Man & Woman of the Year Awards. Nominations are open April 29 through June 7. Ernesto Paredes and Joni Meisel are the 75th Man & Woman of the Year! Ernesto Paredes and Joni Meisel are the 75th Man & Woman of the Year and were honored on September 5th at the Coral Casino. Click the picture to learn more about the recipients at Noozhawk.com. In the video above, Ronald V Gallo, President & CEO of the Santa Barbara Foundation; Ken Saxon, Founder of Leading From Within; Victoria Juarez, Executive Director of Girls Inc. Carpinteria; Alana Walczak, Executive Director of CALM; Jon Clark, Executive Director of James S. Bower Foundation, share their admiration and thoughts on Ernesto Paredes and Joni Meisel (who also share their shock on winning the award), Santa Barbara’s 75th Man & Woman of the Year! The Man & Woman of the Year awards honor extraordinary service and voluntarism in Santa Barbara. Past recipients of the award served Santa Barbara and strengthened the community by mentoring children, caring for people in need, responding in time of disaster, and promoting education. Thank you to all that nominated a Santa Barbara resident whose service represents a meaningful commitment to the community, addressed a real community need or enhanced the quality of life in Santa Barbara, or has involved acts of generosity, kindness, or innovation. 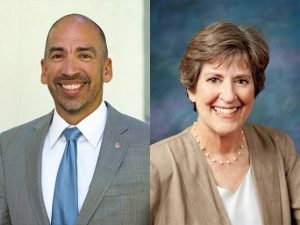 The selection committee, comprised of past recipients, voted on August 15 and selected Ernesto Paredes and Joni Meisel as the 75th Man & Woman of the Year on August 15. Learn more about the recipients at Noozhawk.com. Interested in becoming a sponsor? Contact Jordan Killebrew at JKillebrew@sbfoudation.org or (805) 880-9365.